^ Walter J. Boyne. Encyclopedia Of Modern US Weapons (P.226). NEW YORK: BERKLEY BOOKS. 1995年. ISBN 0-425-16437-3. ^ Diaz, R. Gary. "Intervehicular Information System (IVIS): The Basis for a Tactical Information System", SAE Paper Number: 940982, General Dynamics, 1 March 1994. ^ Conroy, Jason & Martz, Ron. Heavy Metal: A Tank Company's Battle To Baghdad. Potomac Books, 2005, p. 158. ^ Richard Sisk. The 'Beast of Hit,' Abrams Tank Plays Role in Iraqi Fight against ISIS. Military.com. 2016年4月13日 （英语）. ^ The Beast’ Takes on IS in Iraqi City of Hit. 美國之音. 2016年4月13日 （英语）. ^ An Iraqi tank, dubbed 'The Beast,' is on a battlefield tear. 美聯社. 2016年4月13日 （英语）. ^ 伊斯蘭國的惡夢 伊拉克政府軍的M1A1戰車. 中時電子報. 2016年6月13日 （中文）. ^ Australian National Audit Office report on the DMO project Land 907. Australian National Audit Office. [2009-06-09]. （原始内容存档于2010-01-17）. 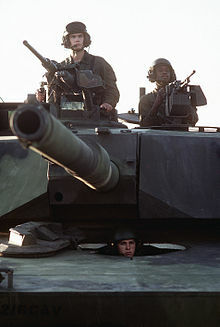 ^ M1A1 / M1A2 Abrams Main Battle Tank. 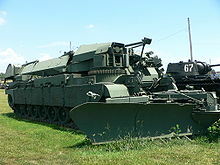 Army Technology. [2010-06-30]. ^ The 2006 Saudi Shopping Spree: $2.9B to Upgrade M1 Abrams Tank Fleet. DefenseIndustryDaily.com. 4 January 2011 [28 July 2011]. ^ Agence France-Presse "Greece Considers Free Tank Offer". 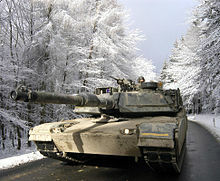 Defense News, 7 December 2011. Retrieved: 18 April 2012. ^ Peru; Future main battle tank projects lags on despite criticism 互联网档案馆的存檔，存档日期28 September 2013.. Dmilt.com, 2 September 2013.